The prices are in US dollars Free Shipping On Orders Over $200! * Taxes Included! 1. The harness is attached to the client's head, and straps are attached to wrists and ankles simultaneously as illustrated by this diagram. 2. Harnesses are connected to the biofeedback device. 3. The INDIGO is connected to the computer. 4. Harnesses may be attached to the client at the area of the condition being treated. The client may also be treated using probes, mats and other accessories which are connected to the INDIGO. * The INDIGO is the newest version the SCIO. It is faster and has an additional computer chip that allows for multiple therapies to be running continuously throughout the session. Quantum Stress Reduction uses the INDIGO, the newest version. What does INDIGO actually do? The INDIGO scans the electromagnetic frequencies of the body similar to the virus-scan on a computer. The scan detects any viruses, deficiencies, weaknessis, allergies, abnormalities, and food sensitivities. In less than four minutes, nearly nine thousand parameters of health are scanned. During testing the device resonates with thousands of tissues, organs, nutrients, toxins and allergens for one hundredth of a second each, and recoreds the degree to which the body reacts. This type of rapid testing is known as the Xrroid process. These measurements indicate needs, dysfunctions, and vulnerabilities. Unlike harmful x-rays, wich focus on physical alignment or blood tests which contain chemical analysis, the information reveals the direction in which the body is focusing its energy. And after the client is scanned? After the INDIGO measures the vitamin levels, amino acids, nutrients, food substances, minerals, enzymes, natural sugars, toxins, hormone levels, muscle tone, disease, bacteria, moulds, fungi, viruses and the health and balance of internal organs, a comparison is made between these readings and the program's "norm". The INDIGO communicates with the body to determine what energy imbalances are most affecting the health. Reactions to foods, chemicals, or other substances are revealed and further investigated through personal interviews, and other programs and screens within the INDIGO. The investigation may locate patterns or specific past experiences. For example, if someone has digestive problems, a previous virus, possibly in childhood, may be found to be the source of an existing condition. So you just use the INDIGO to identify problem areas? There are many programs on the INDIGO. After measuring the body's frequencies, the INDIGO can be employed to feed back appropriate healing frequencies to neutralize or redress destructive wave patterns. In some cases, the device may add frequency, in others reverse it to either enhance or counteract the body's own resonances. Can it help prevent disease? In the field of energetic medicine, any disease or poor health syndrome can be redefined as a disruption or distortion arising in the informational energy field. Besides addressing health problems, the device can also be used for the prevention of health problems by detecting problems in the energetic field before they materialize physically. These imbalances at the energetic level can be an early warning system. If imbalances go uncorrected, eventually physical symptoms will erupt and health problems and disease develop. You can use the INDIGO on animals/pets? YES! Animals are unable to communicate with us in the most obvious of ways, although it may be apparent that they are suffering both from physical and psychological problems. Pet owners have seen vast improvement in the behavior and increased vitality of their pets. Is the INDIGO suited to children? Yes. Children are usually unable to verbally communicate their needs. Children with behavioral problems often improve due to unearthed contributing factors, such as food intolerance or brain wave patterns. The INDIGO has been devised using the principles of Quantum Physics. It requires a paradigm shift in thinking to move from a see-able, materialistic way of viewing the world, to allowing room for the unseen connection between the physical body and the subtle forces of energy. The most basic explanation of "Quantum" is the discovery of an invisible relationship between matter and energy and the ability to measure those patterns. All matter has it's own vibrational frequency. Everything - emotions, thought forms, viruses, bacteria, neurotransmitters, sound, and color all have resonant frequencies. Each has a characteristic electromagnetic waveform. Many substances and chemicals have been identified and catalogued by discovering and measuring the electrical charge peculiar to each item. 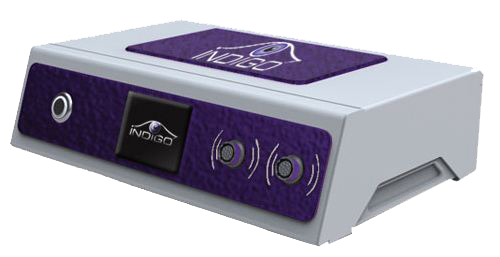 The INDIGO uses the biofeedback principle to detect abnormal and aberrant frequencies within your body. 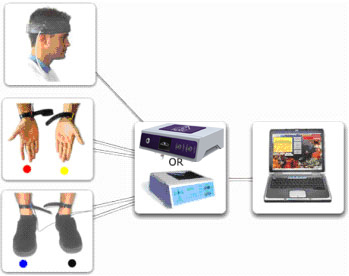 The system uses a computer to measure an individual's evoked potential or reactivity to over 9000 frequencies associated with the human body which are contained in an internal test kit in the device. Comparing known energetic signatures via their electromagnetic waveforms with those in an individual's information field provides the basis for discerning tendencies and disease. Calibrates to the client's energetic parameters. This is known as the "handshake" between the computer and the client. This provides the SCIO with a baseline from which to begin the test. Compares the resonant frequencies of the body with the frequencies of nearly 9000 known compounds. The INGIGO is considered the largest software database of these frequencies in the world. A reaction score is given to each tested item. A high score indicates the importance of impact of the items for each individual client. Reports the body's frequencies to the practitioner which can be explained to the client in easy to understand numbers, charts and text. Once the main concerns have been established and highlighted, the practitioner can then begin a more thorough investigation of the client's current state of health and 'window in' on the main concerns of the client so that therapy may begin. Feeds back its own frequencies via recommended homeopathic therapies, biofeedback, electro-acupuncture, meridian, and naturopathic balancing to redress or neutralize destructive wave patterns. During treatment, the INDIGO measures the body's resonance and reactance pattern determining what benefits have occurred in the time period since the last measurement (less than a second earlier). If there is no improvement, the input resonance is altered. Each setting is maintained as long as changes are occurring. The body's health depends on information fields on the energetic or quantum field level. These information fields are an active, creative force, intimately involved in the form and manifestation of one's state of health. How? Because the energy body infuses the physical body. It forms a type of template (energetic blueprint) for the physical body. When we examine the body's health through the viewpoint of the energetic body, we are able to assess the correct informational fields, which produce good health. And we can also detect disturbed informational fields, which produce diseases or health imbalances. A disease or poor health syndrome can be redefined as a disruption or distortion arising in the energetic blueprint. In simple terms, a health problem is a glitch in the programming of one's informational field. Disruptions can be caused by stress related to toxins, environment, trauma, genetics, deficiency, mental factors, and lifestyle. Stress causes erratic vibrations and leads to disharmony. Head injuries, even those that have not caused unconsciousness, are particularly significant in the disruption of energy patterns and can cause effects years later. Why would these disruptions stay? Why wouldn't the body "self-heal"? Once these disruptions are present, they may be perpetuated by cellular memory. Any disruption in the energy body results in a reduced flow of energy to and through the corresponding part of the physical body. Therefore, there is less healing energy available to the very area that most needs it! If the disruption is large, manifests as disease or impaired function on the physical-emotional-mental-spiritual planes. Healing can be accomplished by correcting these disturbances, which can then eliminate the disharmony and the chaotic patterning of the health problem, and restore natural health. Correcting the energetic blueprint of the body enables the body to heal itself, naturally. Indigo is able to address the vast mathematical computations of quantum physics, which it requires a paradigm shift in thinking. It requires we go further "upstream" to the source of error in our informational programming fields to find the errors and disease. By addressing the field disturbances, we are able to unfold a new energy of greater resonance to soothe the disharmony of the body and spirit, and coax forth new healing energies. The following programs contribute to the INDIGO’s ability to retrieve 90,000 different signals that your body is giving out at any given time. There are hundreds of different training programs that may used back-to-back in limitless combination’s to obtain optimum results. Additionally, it is able to run up to four complimentary programs simultaneously for a highly synergistic and enhanced effect. Performs a baseline measurement of stress related imbalances in the polarity of the organ systems, and allows for retraining those stress patterns. Retrains stress patterns in three primary waveforms found in healthy tissues: capacitance, inductance, and conductance. Re-educates the brain to function for optimal learning. Allows for retraining stress patterns in the sympathetic, parasympathetic and vagus nerve. Re-educates the muscles and nerves associated with and supporting the spine. Allows for re-education and stress reduction programs specific to performance enhancement. Sends homeopathic and nutritional signatures for stress reduction. Helps clients redevelop healthy adrenal patterns in relation to stress responses. Re-educates neuro-transmitter reactions and retrains clients reactions to emotional and mental health factors. Strengthens the clients innate healing abilities, encourages the ability to tolerate higher vibrations and frequencies. Chooses from 256 potential color frequency patterns choosing the ones that will most harmonize the client’s stress. Provides training protocols and visualizations for balancing stress factors interfering with the subtle energy centers known as the chakras. The INDIGO identifies and measures the stress levels - toxicity - all the way down to the cellular level - all 200 trillion of them! Individuals and families find biofeedback an affordable, safe, easy to use tool for monitoring and managing all kinds of stress and stress related symptoms at home. Many individuals complete their Biofeedback Specialist Certification and begin a private biofeedback practice, helping others. While others team up with others and see clients with their device in wellness centers, doctors and chiropractors offices. From a wide array of complimentary modalities use biofeedback as an additional technique with which to educate their clients, assist them with managing stress and pain, and teach people how to take control of their lives, making positive changes in their physiological states and their overall health. Use the INDIGO Biofeedback System to identify and retrain, very quickly, the emotions that are most reactive for that client - which can often help build rapport and speed the therapeutic process immensely. Have been using biofeedback for years to enhance performance. Stress reduction and pain management can really give athletes an edge in their sport. In fact, INDIGO Biofeedback practitioners are currently receiving recognition internationally for their work with Olympic athletes and professional sports teams in leading sport nations with outstanding results. Health professionals from all modalities find that the INDIGO Biofeedback System matrix reactions can provide valuable clues and benefits, as to the stressors most affecting their client. This helps them direct a more individualized and effective stress management intervention, without toxic medications or invasive measures. Find biofeedback a less costly, drug free, non-invasive, accurate assessment tool - informing their diagnosis as to various kinds of stressors which may be at the root of illness; as well as a necessary means of educating clients and helping them address or manage these stressors. The LCD screen on the interface box is also touch screen.